Tony Rubin Sjöman is one of Sweden’s leading contemporary street artists. The art book Rubin: New York / Scandinavia showcases his large scale geometrical murals and brings you to the New York City expat’s studio in Brooklyn. It is a book about art but also about contrasts: beauty versus ugliness, grief versus resolution, the metropolis versus the wilderness. Tony Rubin Sjöman grew up in a Finnish immigrant home in Gothenburg, Sweden. Today he resides in New York City, where his signature murals can be seen all over the city, from gritty factory walls in the Bronx, to churches in Brooklyn and upscale shopping districts in Manhattan – all bind together by his abstract patterns, reminiscent of Scandinavian design and the brutal architecture of the housing project where he grew up. Rubin was nine years old when he wrote his first tag. Surrounded by grey concrete and tram tunnels, the walls whispered his name. He grabbed a spray can and set out on a journey that he’s still on today. The move to New York altered his perspective and allowed him to work in a more tolerant environment than that of Gothenburg, where the zero tolerance policy against graffiti has long been the norm. 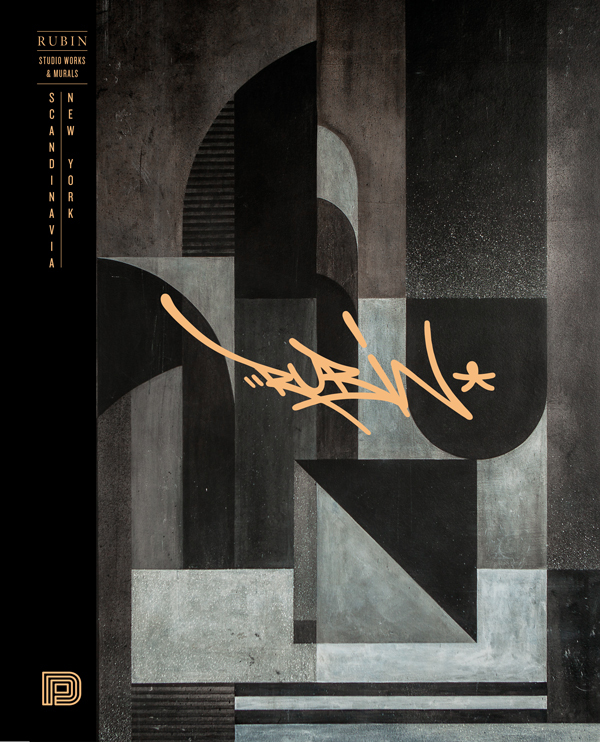 Rubin deconstructed his form of expression, discarded the lettering and perfected his shapes, hence creating a unique aesthetic that carries the art form beyond its boundaries. Rubin’s art is about beauty and grief, alienation, struggle, balance, energy, the cityscape versus wilderness and the notion of class. It’s about a child’s fascination with a magical art form. “I’m inspired by the contrast between New York City and the wilderness of Lapland, where I have spent the summer months ever since I was a child. Finnish design, such as Marimekko textiles and Alvar Aalto mugs were pretty much basic household items in Finnish working class homes when I was a child but it wasn’t until much later that I learned about architecture and the likes of Eero Saarinen, Alvar Aalto and Matti Suuronen, and they have all inspired my work. I’m also inspired by the almost Neo-futuristic concrete surroundings of Bergsjön, the neighborhood where I grew up, and that I used to consider ugly – the patterns on the balconies, the shapes of the concrete at the tram stops and the water tower that is shaped like a giant UFO. While Rubin's abstract and geometrical pieces are rooted in traditional graffiti, they break the rules of the craft with their muted color palette and Scandinavian clean lines. The book Rubin: New York / Scandinavia takes you inside his studio, to art galleries and on a journey through the streets of New York City. RUBIN: New York / Scandinavia is published by Dokument Press, a market leader in the field of quality books on urban culture and street art for more than 15 years. Texts by Björn Almqvist, the author of several books on graffiti including Writers United and Graffiti Burners.